Size: Please refer to the bullet point or the size picture. Material: High quality faux leather + fully-lined fabric Interior. - Adjustable strap keeps shoulder straps in the perfect position for comfort. - Vintage and soft faux leather material offers excellent and smooth hands feeling. - Reasonable roomy design makes your daily essentials organized and manageable. -Multiple pockets help keep your daily essentials manageable and organized without the hassle. - A nice choice for your family, friends and lover as her birthday and holiday's present like Birthday, Mother's Day, Valentines's day and Christmas Day and so on. 1. If you receive broken, damaged or wrong item, please contact our customer service with pictures, after confirming it, we will refund or resend in 24 hours. Dimensions: 10.5"W x 15"H x 7"D / Handle Drop Length: 3"/ Shoulder Strap Length: End to End 32". Fashionable, practical and multi-function design. You also get a handle on top for carrying or placing it on a hook. 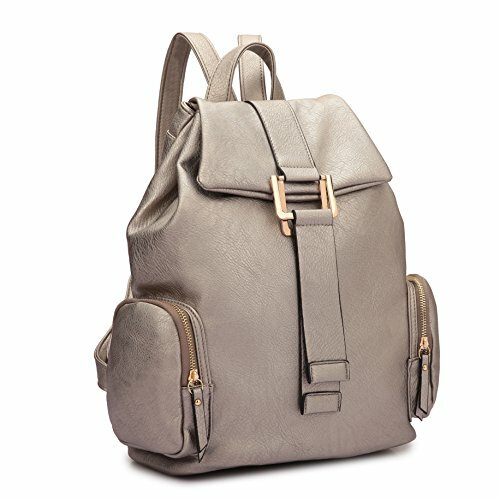 Ideal casual daypack purse for adults or teens at school, work, weekend getaway , occasional travel,etc. Material: High quality cow faux leather with durable golden hardware, sturdily constructed with detailed streamlined stitching and fully lined with smooth polyester lining. Waterproof, wear resistant and durable in use. Interior: 1 Center Divider Zipper Pocket / 2 Front Wall Open Top Item Pockets / 1 Back Wall Zipper Pocket . Exterior: 2 Side Zipper Pockets. / 1 Back Panel Zipper Pocket. Large capacity for holding all your essentials and varieties of colors available. Our goal is to ensure that you're 100% satisfied with your purchase right out of the box. If you're not satisfied for whatever reason, we will gladly accept your return provided that you request authorization within 36 business days of the delivery date.